Echium candicans is a short lived shrub, usually 4-5 years in our gardens, though a few have lasted longer. Fortunately for the cost conscious among us the Pride of Madeira generates loads of seedlings. Also fortunate for those of us given the task of thinning those seedlings to a manageable number, they are pretty easy to pull in their first season. 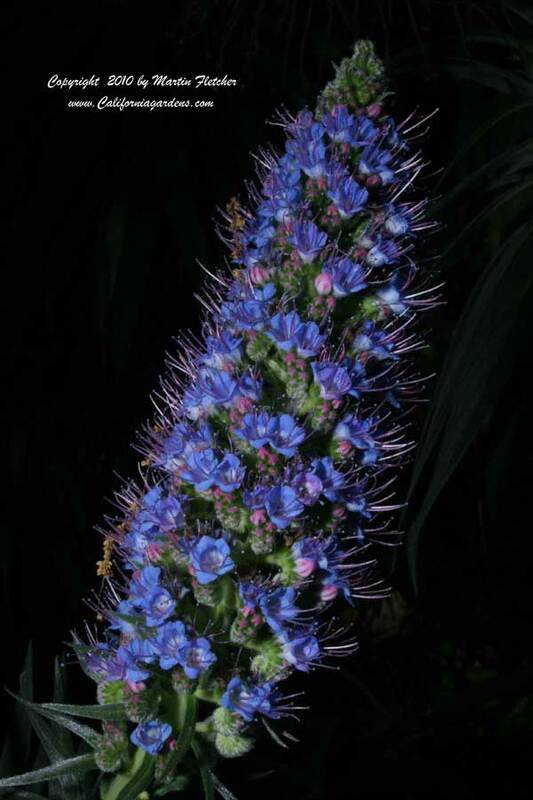 Echium candicans will grow 6-8 feet in height and are usually a little wider than tall. Shaping your Pride of Madeira as it encroaches out of its prescribed space often leaves dead branches if the branches are lopped off below the point where there are still leaves. The blue flower spikes bloom in the Spring. The bees love them. Some folks get a skin irritation from the hairs on the leaves and flowers. Echium candicans grows well in full sun or high shade. Soil type is not so critical, but soggy conditions are hard on these guys. Plants are hardy into the mid 20°s F.
Red flowers of Echium candicans - Pride of Madeira. High resolution photos are part of our garden image collection.